The summer is full of fun food. From the sweetest fresh fruits to the crispest fresh garden vegetables to a succulent red ripe garden tomato and even to those favorite dishes and grilled things we spoon on our plates at the many summer BBQs, parties and holiday celebrations. For those healthy eaters out there (that I’ve now become), we can be lead astray by some of those summer favorites. Salads packed and layered with mayo, desserts decadent with cream, butter and sugar. BUT we don’t have to be trapped. Healthy does not at all have to mean a lack of flavor! Who doesn’t love it? Whose Mamaw doesn’t make the BEST one? It’s good! No way around it. Unfortunately, most of our grandmother’s recipes for potato salad are full of fatty mayonnaise. 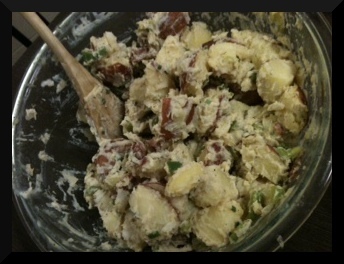 Skinny taste to the rescue again: http://www.skinnytaste.com/2009/06/baby-red-potato-salad.html! I was on call for 4th of July and couldn’t attend the family BBQ, so my brother drove up and we had our own little cookout. 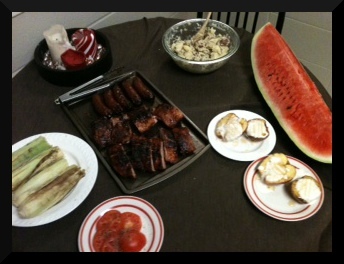 He made ribs and I made the sides and dessert. It took a little convincing for me to talk him into letting me make a potato salad that wasn’t like our Mamaw’s, but he loved it! He said he even liked it better than normal potato salad. That speaks volumes, especially since he’s not even on a diet! I made the recipe exactly like hers. For the very minimal mayo I used Kraft 50 % less fat olive oil mayo. Make sure to let it sit. It tastes so much better if it rests for at least 30 minutes. The fruit summer offers is too good to not take advantage of! You’ve seen my previous posts with summer fruits like the strawberry cookies and strawberry trifle. But the dessert I made for our cookout was with peaches and apples! I roughly used skinny taste’s grilled peaches recipe: http://www.skinnytaste.com/2010/05/grilled-peaches.html. I used 1 peach and 1 apple, I prefer gala or fuji. 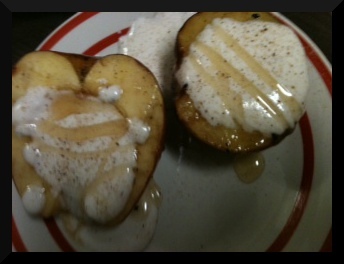 Sprayed them with parkay spray butter, sprinkled them lightly with brown sugar. My brother grilled them, the peach was soft, the apple was not, but I like it that way. I mixed 1/2 cup of non fat plain greek yogurt with about 2 tbsp of honey. Then I mixed in 1/4 cup of fat free cool whip and sprinkled with cinnamon sugar and mixed it into the mixture. I topped each half with a couple tablespoons of the mixture and drizzled honey on top. I also used my cinnamon sugar grinder to sprinkle cinnamon on top. Our very first cookout with no help from parents, grandparents, aunts or uncles was a success! Make the most of the rest of summer! Grill everything! Watermelon is lovely grilled as are pineapple, peaches, apples, and every vegetable. Eat fruits like they are going out of style! Because they soon won’t be as luscious and cheap. Mix 2 tablespoons of Nutella with 1 splash of milk to thin it out and dip strawberries in it! Best dessert and snack ever! And healthy! Enjoy it while it lasts. Soon our recipes will be filled with pumpkin, aromatic spices and winter squashes.